Leap Motion Controller - LM010 - VR - Hand Tracking - PC Gesture Control. In perfect Condition. See pictures for details. Shipped with USPS First Class Package. 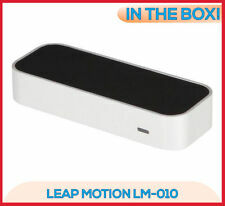 Leap Motion Controller, LM010 (Virtual Reality Hand Movement tracking). We are unsure what is wrong with the unit. Quick setup: download the Leap Motion software, plug the device into your USB port, and you're ready to go. For PC And Mac LM-010. Windows 7 or 8 or Mac OS X 10.7. Real 3D interaction: 150-degree field of view creates a wide interactive space between you and your computer.